Wow! So did I ever think keeping up and posting to this blog would be so tough? For now, I really wanted to share this very COOL DOLL I purchased a few months ago on www.etsy.com. She is exquisite! Though I have no current plans to use her in the Brownstone. I do think she is just gorgeous...all white and dead looking, as she is. She seems to be an interesting combination of "Interview with a Vampire" meets "Marie Antoinette." 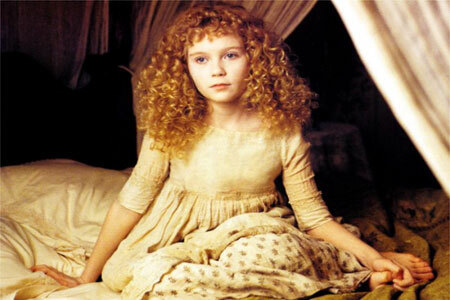 And as I write this...it just occurred to me that Kirsten Dunst had a major roll in both of these films. 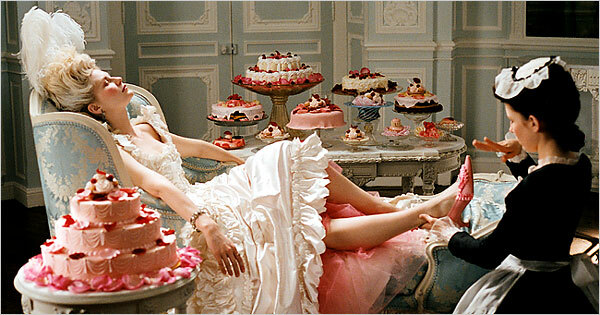 So here's Kirsten just lounging around as Marie! And another as that scary kid from "IWAV"
The doll artist goes by the name of Sarangela on etsy. And here is a direct link. 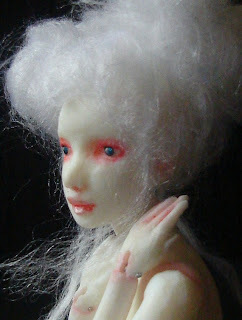 She is a ball-jointed doll and made from cast resin. Personally...it looks like it took a lot of work to me. But I am glad someone had the time to do all the fussy little detail stuff. She is one of my favorite purchases so far, and stands about 6 inches tall...including her poofy hair. So perfect doll house size! She would look really fab dressed in some Versaille-type garb. But the truth is...I kinda dig her naked. Ha! Like I said...not sure what I plan to do with her yet. Perhaps a room box of some sort. Maybe with a haunted theme. She definitely has a haunting sort of appeal...but in a very cool way! The photos came directly from the listing...so they are the property of the artist. But I am assuming she won't mind a bit of free advertising. I think the dolls she makes totally ROCK! For a larger image, just click on the photo.